I got on the Social Security Administration’s Life Expectancy Calculator and found out that I’m probably going to live until 83.1 years. That means that October 2041 is going to be a bad month for me. Two weeks ago, the Center for Disease Control reported that for the first time since 1993, the U.S. life expectancy decreased by 0.1 years to 78.8 years. Since the report came out, there has been a lot of speculation about the causes: increased opioid abuse-related deaths, the effect of obesity, etc. 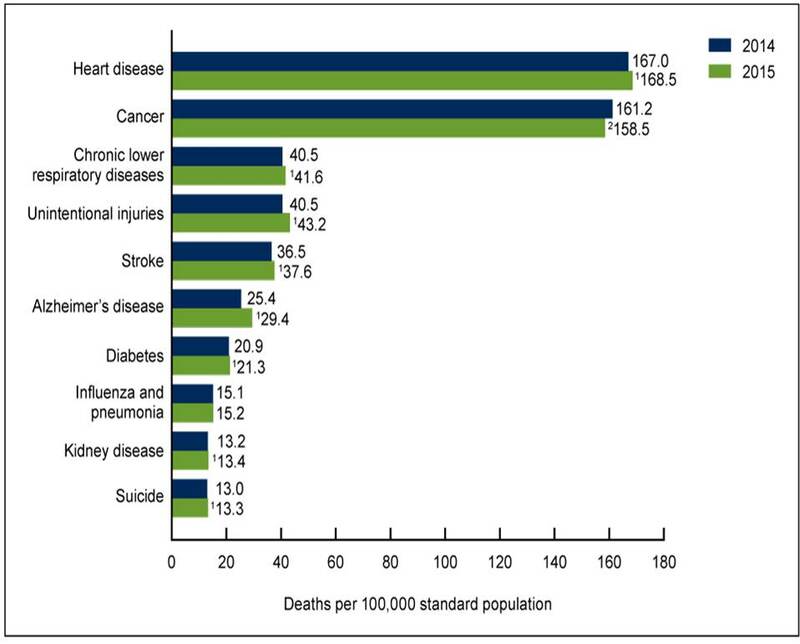 But if you look at the data, the death rate is up for heart disease, respiratory disease, accidents, stroke, Alzheimer’s disease, diabetes, kidney disease, and suicide. 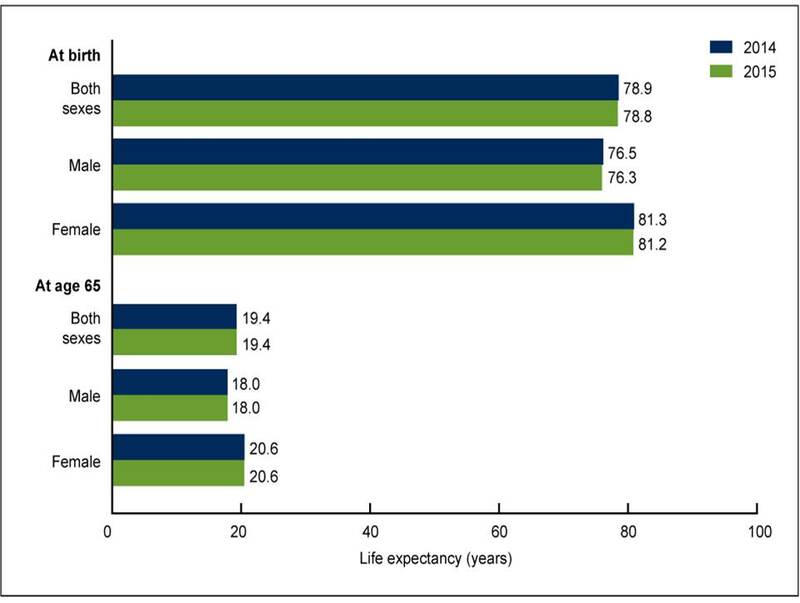 Americans already live shorter lives than inhabitants of other economically developed countries. The OECD (Organisation for Economic Cooperation and Development) reports on the life expectancy in 43 countries – the U.S. ranks 26th, just above Chile, the Czech Republic, and Turkey. But will the reduction in American life expectancy save Medicare? This year, the Medicare Board of Trustees determined that the Medicare Hospital Insurance Trust Fund was going to run out of money in 2028 and after that time, federal Medicare tax revenues will only be able to cover 87% of Medicare costs. The reason is that there is a bolus of baby boomers retiring and going on Medicare, plus people were living longer (at least up until this year). One of the problems is that when Medicare was created in 1965, it set the retirement age that Americans become eligible for Medicare as 65 years old. At that time, the life expectancy from birth was 66.8 years for men and 73.7 years for women. Now, men live 9.5 years longer and women live 7.5 years longer. But the Medicare eligibility age has not changed and has remained 65. If you just take those people who actually make it to age 65, then in 1965, the average American would live 14.8 years on Medicare and now they live 19.4 years on Medicare. That is an increase of 4.6 years since the inception of Medicare, a 31% increase in the demands on Medicare. If this year’s reduction in American life expectancy continues as a trend in the future, then it would take 46 years to reduce life expectancy back to 1965 levels and Medicare will run out of money in 12 years. So living shorter lives probably isn’t going to work. We could reduce Medicare benefits and require seniors to pay more out of pocket for their health care but given the increasingly large voting block of people over 65, I doubt that any congressman supporting this measure will stay in congress very long. Reducing Medicare costs by reducing health care costs sounds great in theory but given our lack of success in the past 30 years, I don’t think we can count on costs coming down in the near future. So, that pretty much leaves increasing the Medicare eligibility age or increasing the Medicare payroll tax (currently at 2.9% of wages). My preference would be to tie the Medicare eligibility age to the U.S. life expectancy so that the projected average number of years an American would have Medicare coverage would be something around 18 years. With current life expectancy, that would mean increasing the Medicare eligibility age from 65 to about age 67. The bad news would be that you’ll have to retire 2 years later than your grandfather did but the good news is that you are going to live 4.6 years longer than he did. By increasing the eligibility age from 65 to 67, there will be two additional years that Americans pay Medicare payroll taxes and two fewer years that they are consuming the Medicare Trust Fund. On the surface, this sounds like making Americans work more years. However, according to the U.S. Census, in 1965. about 50% of American adults completed high school; in 2015, 88% of adults completed high school. 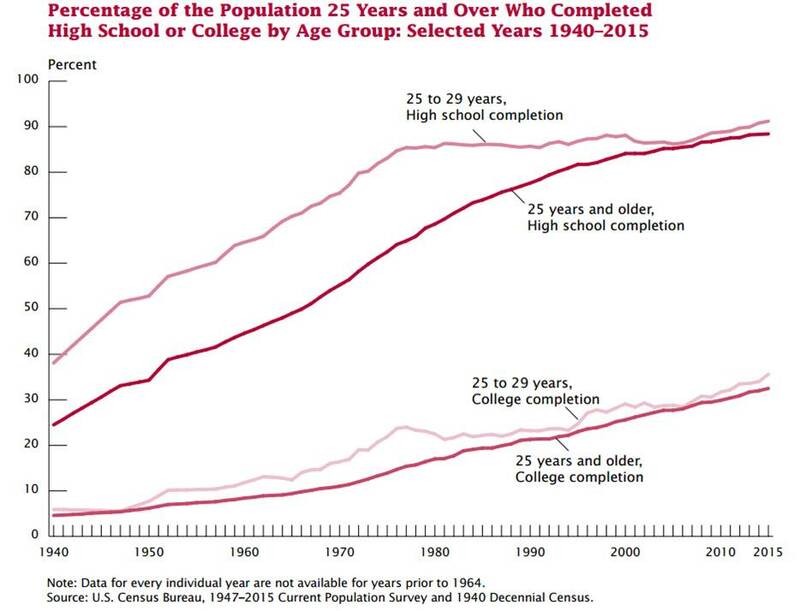 In 1965, about 10% of American adults completed college; in 2015, 34% of adults completed college. Therefore, Americans are completing their education and entering the workforce at an older age than they did in 1965 so by extending the Medicare eligibility age by 2 years to age 67, we wouldn’t be asking the average American to work more years than their grandparents did, we’d really be asking them to work the same number of years as their grandparents did. So, the bottom line is that Americans don’t live as long as residents of other countries and we’re not living as long as we used to. However, our declining life expectancy alone will not save Medicare. We’ll have to take other measures.